The Far Eastern Group (FEG) which spans across 10 industries and is leader in each of their respective sectors was established by Mr. Yu-ziang Hsu over six decades ago. With the Group's revenues, net profits, and total assets growing continuously, it now ranks among Taiwan's top three conglomerates. The Far Eastern Y. Z. Hsu Science and Technology Memorial Foundation (Y. Z. Hsu Foundation) was set up in memory of my late father, the Group's Founder, as a tribute to his outstanding achievements in industrial developments and social contributions, a legacy passed down from him which has profoundly influenced all members of the Far Eastern Group. Mr. Y. Z. Hsu has always been a committed social citizen since his early years as an industrialist who aimed at giving back to the society. Far Eastern Group's CSR efforts started in the early 1980's. In the initial stage of the Group's business development, he established the Far Eastern Girls' Basketball Team to support and promote sports in Taiwan. Throughout the years, the amount the FEG has spent in public interest in various sectors has reached over NT$ 50 billion. Furthermore, besides donating money, Mr. Y. Z. Hsu had been actively involved in promoting public interest. In the field of education, he founded the Oriental Institute of Technology, Yu Chang Technical and Commercial Vocational Senior High School, and Yuan Ze University. In the field of medical care, he established Far Eastern Memorial Hospital and Far Eastern Polyclinic. Among these institutions, Yuan Ze University and Far Eastern Memorial Hospital have both won the National Quality Award, evidently illustrating that the Far Eastern Group applies high business standard to engage in its public service organizations. In addition, the FEG also established the Far Eastern Medical Foundation and the Far Eastern Memorial Foundation, in order to set up the Far Eastern Memorial Hospital and to sponsor cultural, artistic, and architectural activities. Mr. Yuan Ze Hsu is father of Mr. Y. Z. Hsu and also my grandfather. Mr. Y. Z. Hsu established the Medical and Memorial Foundations in memory of his father; I also followed his footstep in setting up the Far Eastern Y. Z. Hsu Science and Technology Memorial Foundation in memory of my father. One of the major goals for the establishment of the Y. Z. Hsu Foundation is to advocate Mr. Y. Z. Hsu's persistence on "Innovation". Looking back at how Mr. Y. 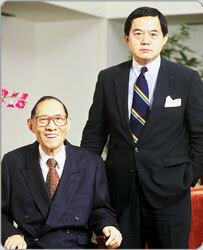 Z. Hsu had run the Group businesses, we can realize the importance and dedication he had towards innovation. For example, in 1968 he decided to go up-stream and enter the new field of polyester fiber business. At that time he had to choose either the more popularly used dimethyl phthalate (DMT) technique or the newer, cheaper, but uncertain terephthalic acid (TPA) technique. After carefully reviewing and assessing all related cost, benefit, and risks, he decided to adopt the TPA technique. The choice of this technique has brought tremendous success to Far Eastern New Century and allowed the company a major competitive advantage in the vertical integration of its up-stream, midstream, and down-stream operations. The TPA technique has later become the mainstream technique used in the polyester fibers industry. Another example is that back in 1975 when the Government was implementing the Ten Major Construction Projects and cement was in short demand. Asia Cement Corp. (ACC) decided to build its Hualien Plant in eastern Taiwan. During the Plant's construction, Mr. Y. Z. Hsu initiated to implement "preheating combustion forging type rotary kiln and gear-free cement grinding". At the same time, with friendly-to-the-environment being the first priority, the ACC has also adopted the most advanced "direct pit type mining transport system" in mining the mountain in the Hualien Plant. The investment in all types of dust collecting equipments and environmental protection had accounted for an amazing 10% of total capital expense. That is why Hualien Plant has been outstanding among its competitors in both production efficiency and quality. Moreover, its effort in greenification of the plant areas and the mines has made the plant a popular local scenic spot. How much emphasis Mr. Y. Z. Hsu has placed on breakthroughs and innovation is illustrated from the above examples. That is why we have focused on "technology and innovation" when planning this Foundation. While most non-profit foundations in Taiwan focus on providing financial support to cultural, educational, and social benefits, we feel that technology and innovation have been key factors in sustaining Taiwan's economic growth and upgrading its industries. Therefore, at the end of 2001, one year after Mr. Y. Z. Hsu's passing away, we completed the preparatory work for the Foundation in less than 12 months and received the approval for its establishment from the National Science Council (NSC) of the Executive Yuan. This Foundation became the first private technology foundation supervised by the NSC. After its inception, the Foundation sponsored the "Y. Z. Hsu Scientific Award" to encourage outstanding science and technology talents in the domestic academia, focusing on promoting the four major emerging technology and innovative sectors of nano technology, optoelectronics & communications, bio-medical technology, and green technologies. In recent years, the Foundation has also dedicated to encouraging young talents and held the "Y. Z. Hsu Cup – Taiwan Young Students Physicists' Tournament". Young talents are selected, trained, and supported to participate in contests overseas and have gained excellent results. In addition, the Foundation will host the "International Young Physicists' Tournament" (IYPT) in 2013. Furthermore, after years of scrupulous planning, the "Y. Z. Hsu Memorial Hall" is already in the final stage of detailed design and will start construction soon. Many of the above mentioned activities are among the first and the most innovative compared with other charity-oriented foundations. The amounts of various prizes are also the highest among similar awards. In so doing, we hope to bring vitality to Taiwan's scientific and technological innovation as a continuation of the spirit of Mr. Y. Z. Hsu. Mr. Y. Z. Hsu once said that the ultimate purpose for an enterprise in pursuing profit is not to keep the business running, but most importantly to promote the prosperity, wellbeing and vitality of the society, the people, and the nation. Therefore, fulfilling our corporate social responsibility is deeply embedded in the Far Eastern corporate culture. The Far Eastern Group has been established for over 60 years in Taiwan. To Chinese, 60 years represent “Yi Chia Tze”, which has great symbolic meaning. The FEG has enjoyed continuous growths and developments during the last six decades. In addition to the founding motto of “Sincerity, Diligence, Thrift, and Prudence” set up by our Founder, I am convinced that the “Innovation” spirit which I have added has already been internalized as the growth momentum for all members of the Far Eastern Group. Six decades for the Far Eastern Group, social responsibilities for life – our commitment to public interest shall be ever-lasting.